At this point, of course, the story behind “Ohio” probably outstrips the song: on May 4, 1970, members the Ohio National Guard opened fire on a group of unarmed college students protesting the bombing of Cambodia, killing four and wounding another nine. 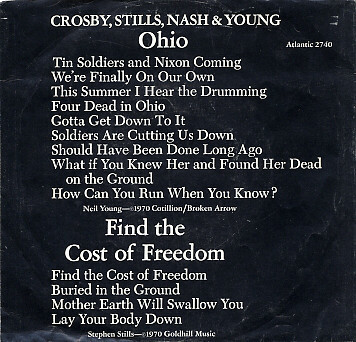 This pissed Neil Young off so much that he angrily put together a song, gathered David Crosby, Stephen Stills & Graham Nash into a studio in Los Angeles, recorded “Ohio,” then used their clout with Atlantic Records to get it rush-released in June. This, despite the fact that Atlantic had just released “Teach Your Children” as a single. The opening verse is basically Neil singing basically alone — maybe Crosby is doubling him — over a biting guitar riff that wouldn’t have felt out of place on Everybody Knows This is Nowhere, and while it does seem to be a bit of Baby Boomer overdramatization to declare “we’re finally on our own,” Kent State must have felt like an unprecedented act, and became a flashpoint for the anti-war movement. The chilling part is “what if you knew her / and found her dead on the ground?“, a line that took the specificity of the massacre of Kent State — that famous picture — and universalized it. And made it resonate down over the years: What if you knew one of the students at Columbine? One of the people who jumped from the Twin Towers? One of the kids at Sandy Hook? One of the churchgoers at Charleston? Michael Brown or Tamir Rice? One of the country music fans in Vegas? One of the Parkland kids? What if you knew them, and found them dead on the ground? Of course, if “Ohio” was just a set of angry lyrics, it wouldn’t have got as much traction, but it’s also got some killer musical performances, too boot. After the chorus, there’s a great bit of tumbling guitar interplay between Stills & Young over a stop-time beat from out of marches a melodic solo from Stills that leads back into what would have been the next verse had Neil felt he needed one. But clearly he didn’t, because instead, they all sing “La la la la la la la la” until it’s time to head back into the chorus, after which there’s another great guitar break from Stills and the final bit of genius — repeating the first verse and then repeating “four dead in OH-HI-OH” with ever increasing intensity until the fade. It’s tricky to respond with your art to a major news event in basically real time: for every The Rising, there’s like a dozen the 9/11 episodes of The West Wing. Hell, even Neil has tried to replicate the lightning in a bottle of “Ohio,” first with the dull “Let’s Roll,” and a few years later with the somewhat overcooked Living With War. So for “Ohio” to stand up as well as it has after almost a half-century says something great about the song, but also says something sad about the ongoing relevance of the possibilities of finding someone you know gunned down. By anybody.